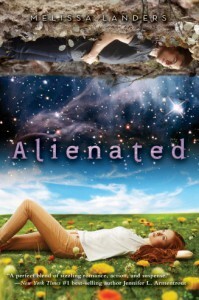 Alienated is one of those books that kind of came out of nowhere, at least for me. I had not heard anything about it before it's publication. Then I started seeing it on book blogs, BookTube and Goodreads and the reviews for it were generally quite raving. 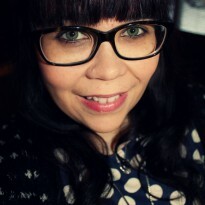 I acquired a copy of my Kindle, thinking that I will give it a chance once I'm in mood for some science fiction. Oh well, it did not really fill my graving for science fiction, but it did give me a load of high school drama and cute romance in a form of a quick, entertaining read. Two years ago, the aliens made contact with the earth. Sharing nearly identical DNA with the humans, the alien race called L'eirhs are like a cold, more intelligent version of the human race. They have been selectively bred and cloned and thus they are in general superior to a ordinary human being. Cara is the Valedictorian and the queen of the debate team, but her school year does not get quite the beginning she expected when she's told that she has been selected to host of the three L'eirh exchange students sent to earth. Though she is not over the moon about babysitting an alien for a year, the scholarship money the exchange brings seems tempting and eventually makes her say yes. The moment Cara sees Aelyx, she realizes that she has never seen a guy quite as hot as her new exchange student. But the hotness is dampened by the cold and collective behavior of Aelyx who seems more like a robot than a human for most of the time. But when the paranoia of the general public against the aliens and people associated with them increases, Cara and Aelyx end up forming a bond that eventually could become something more than just a forced friendship. As I said, this book is very DRAMA heavy. It is the general high school backstabbing drama that is oh so entertaining, but also, oh so unrealistic. Cara is the Valedictorian, but to be honest, she does not seem super intelligent or hard-working. When I hear the word 'Valedictorian' in description for a novel,I expect an awesome, nerdy, a bit socially awkward, hardworking character. Cara is not that. I feel like she spends more time drooling after Aelyx than actually working on school assignments. Aelyx, of course, is super hot, but at first does not seem to have the hots for Cara. But he gets more human side while spending time with humans and realizes that some humans might actually be not that bad. I found Alienated to be very entertaining, fast-paced and occasionally quite funny as well. Surprisingly, the author is able to avoid instalove, which was a definite bonus. I was kind of disappointed about the lack of detail that I usually am able to find from science fiction novels, but very quickly I realized that I should probably just treat this as a high school romance type of book rather than a scifi read. I did not really connect with the characters or the events, but despite that, I did find that Alienated was just what I needed - a bit silly, fast-paced romp for the weekend nights.